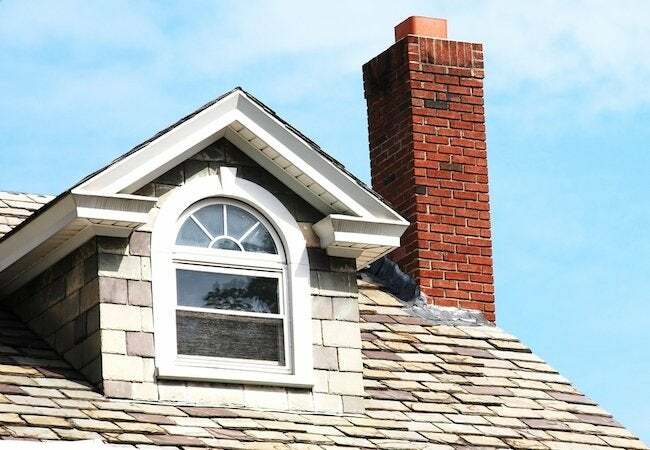 The chimney might not be a part of your home you consider very often, but keeping it in good working order is a critical part of ensuring a safe and healthy home. Built of either brick or stone, traditional masonry chimneys include a firebox (where the wood burns) in addition to a flue, which is the air shaft running through the interior of the chimney, from the firebox up through the roof. At its top, a chimney of this type features a crown to deter critters and prevent water damage. 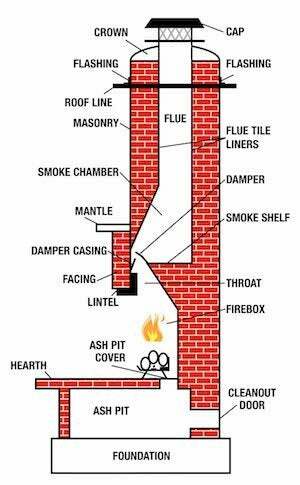 Prefabricated chimneys have a firebox and cap, but they vent through a simple pipe (not through a flue set within a chimney). Compared to a traditional installation, prefab chimneys are more affordable but less durable. Plus, repairing them can be complicated once component parts are no longer available. Whether traditional or prefabricated, all chimneys are fitted with a damper—that is, a moveable metal plate. When open, the damper allows smoke from the fireplace (along with heat and harmful gases, such as carbon monoxide) to exit the house. During the summer or on cold winter nights when you are not using the fireplace, the damper closes in order to help maintain a comfortable indoor temperature. A standard throat damper installs above the firebox and is operated by a handle, while a top-sealing damper mounts at the top of the flue. The latter opens and closes by means of a stainless steel chain, extending down the chimney. When closed, the top-sealing damper serves double duty, not only keeping in heated air, but also keeping out animals, loose debris (e.g., leaves), and precipitation. Rising heat creates an air current that carries heat, smoke, and toxic gases with it along an upward trajectory. Known as drafting, this fundamental principle of convection prevents your house from filling with smoke and hazardous exhaust. Larger flues create stronger drafts, generally speaking, but in any case, eliminating creosote deposits and other clogs ultimately safeguards against chimney problems. Mandatory in some states, flue liners enhance the safety and performance level of chimneys in a couple of ways. One, they prevent the overheating of combustibles adjacent to the chimney. Two, they make the chimney more resistant to the corrosion typically brought about by byproducts of burning wood. Clay tiles, commonly used in masonry chimneys, are inexpensive but known to split apart under intense heat. Those cracks must be repaired, as they enable toxic gases to enter the home. Especially with owners of old homes, stainless steel or aluminum flue liners are a popular choice today, because they are easily installed even in chimneys where an older liner already exists. Highly effective but labor-intensive (and thus more expensive), cast-in-place liners are the product of heat-resistant concrete applied against the walls of a chimney or an existing flue. Without regular cleaning, a highly flammable substance known as creosote may build up within the flue, making the chimney vulnerable to high-heat fires. Burning at temperatures around 2,000°F, chimney fires are capable of extending beyond the chimney itself and into other, more flammable parts of the home. Though prefabricated chimneys are built to withstand very high temperatures, they can be so damaged by chimney fires that replacement becomes necessary. Keeping the chimney clean prevents house fires. For that reason, if you frequently make use of the fireplace in your home, it’s highly recommended that you employ a certified chimney sweep on an annual basis. Many homeowners remember to make an appointment when turning the clock back during mid-autumn.